Our services are comprised of VoIP-enabled cloud telecommunication services. Simple and cost-effective phone solutions for all businesses. For on the go needs to multiple location businesses. With three decades of experience in the Southwest Florida roofing industry, Roofing by Curry remains dedicated to providing the highest quality workmanship and materials at a competitive price. 7085 85th St. Ct. E.
River Club Car Wash - Ranch Lake Blvd. 9500 State Rd. 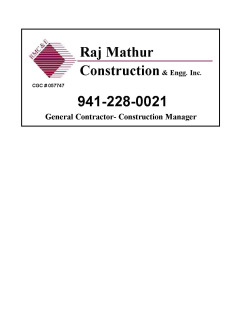 64 E.
Realty Appraisal Services of Southwest Florida Inc.
Raj Mathur Construction & Engineering, Inc.
5009 State Rd. 64 E.